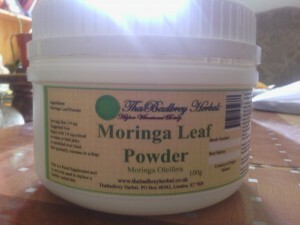 Moringa Leaf Powder - ThaBadbrey Herbal. As far as I am concerned, when it comes to Herbs, Moringa (in this case, Moringa Oleifera) is the “Number One Herb” in the “known” world in terms of Medicinal Quality, Nutrition, General Health & Higher Vibrational Being. This “Miracle of a Plant” can be found growing in abundance in almost all equatorial regions of this planet, its presence being widespread on a global scale. This worldwide availability is especially apparent in many economically/financially deprived, so called, “Third World” countries. It’s almost as if the herb is purposely making itself available to those that are in great need of this wonderfully nutrient dense and therefore nourishing & exceptionally healing natural organism. In addition to the above nutritional information, Moringa also contains all 8 of the Essential Amino Acids that can not(at this point in the biological/physiological and/or Spiritual Developmental Stage of “Us” human beings, within the vibrational state in which most of “Us” seem to currently reside, as well as in accordance to the relevant “scientific research” upon this subject) be naturally “synthesised” within our own bodies. Moringa miraculously allows us to obtain all of these Essential Amino Acids from one source, itself, and thus reduces the perceived “need” of “Us” to have to obtain these Essential Acids from multiple sources. These Essential Amino Acids (which are the building blocks of protein) in conjunction with the various vitamins & minerals that exist within this plant, in an abundance that can only be described as extra-ordinary in scale when compared to other well known nutrient dense plant based foods, is a testament to the reality of this magnificent wonder known to the world as Moringa. Vitamin and/or Mineral Deficiency of Any Kind. …Plus Many More “Modern dis-eases” of which are far too numerable to list here in their full entirety. A whole host of other ailments, not listed above, can also be “tended to” via the utilisation of this incredible herb, due to the fact that Moringa possesses the ability to greatly improve the overall Health & Vitality of the human body as a whole, and thus have the effect of increasing the state of “Higher Vibrational Being” of the individual who uses it for such purposes, regardless of their prior “level/state” of health in general. In effect, anyone regardless of health status can use Moringa, from babies and toddlers/young children, to adults including those who may be deemed to be of advanced age. The usual recommendation for the dosage of Moringa Powder is to sprinkle ¼ tsp (tea-spoon) mixed in water or fruit juice, or sprinkled over food to begin with. This dosage can then be gradually increased to a tbsp (table-spoon), or even an excessively heaped table-spoon for maximum nutritional benefit. It can also be taken in isolation, as it contains a multitude of vitamins & minerals of which are Not available in plentiful abundance within today’s “modern” food supply. Additionally, Moringa is one of the few nutritive herbs that one would be able to live-off of solely, and in isolation from any other food source, without one becoming malnourished as a result. It is truly a Super Herb! Our Moringa Leaf Powder is sourced from the extremely Nutrient-Dense soils of Malawi in South-East Africa, where it is Organically Grown, and is now available here at ThaBadbrey Herbal., at an Affordable Price of just £5:00 per 100grams! Here at ThaBadbrey Herbal., we don’t believe in charging “extortionate” prices for “superfoods” that, in my humble opinion, all human beings on this planet should have affordable access to, hence the relatively low price for this Extraordinary & Amazing Herb!